One New Aftermarket Replacement Intake & Exhaust Manifold Made To Fit John Deere models: M, MI. Replaces Part Numbers: M1799T, M408T, M3060T, M3956T. Our processing system is automated. Thank you for your continued patronage. 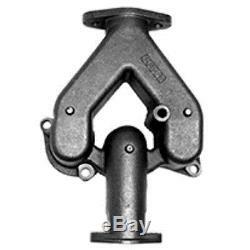 The item "M408T Exhaust & Intake Manifold Fits John Deere M MI M1799T AM626T M408T" is in sale since Friday, August 12, 2016. This item is in the category "Business & Industrial\Heavy Equipment Parts & Accs\Antique & Vintage Equip Parts". The seller is "reliableaftermarketpartsinc" and is located in Williamston, Michigan. This item can be shipped worldwide.